In 2002 Gary founded RE/MAX Action Real Estate. Gary's vision of a high tech, high service firm has made RE/MAX Action one of the brightest stars on the Richmond Real Estate skyline. As an agent Gary has sold more than $120 million in Richmond homes. The success of Gary's business is based on his firm belief that by putting the customer first you always win. Gary leads by example. His unique style of hands on service applies to both his firm and his own personal Real Estate business. If you are looking to make a move in the Richmond area Gary will give you unparralled service. Besides his status as a Broker, Gary is also a licensed real estate instructor and holds a B.S. in Journalism from the University of Kansas. Gary is a former reporter for United Press International and a former assistant to the Kansas Senate Majority Leader. 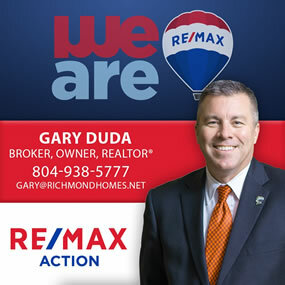 Gary is a member of the RE/MAX 100% club and has been a distinguished achiever each year with the Richmond Association of Realtors since he first began his real estate career in 1995. If you are looking to make Real Estate a career or you just want to make a positive move in your current Real Estate career, call Gary Duda today.